If you're willing, I'd be interested in hearing your take on the historical progression from ˈboːtsweːn to ˈbəʊs(ə)n.
I always used the spelling pronunciation. I'm sure many others do too. Interesting! I just checked the 1881 UK census for people named Boatswain, and got about 40, all with Dorset connections. I then restricted the search to London, there none. I am a Boatswain, my grand parents came from Dorset, in the early 1900's, I have known for some years that there is a bwi (monserrat) connection. How come? The name originates in England as far as I know and I have a family tree from a relative there. I would like to find out more, and we have always pronounced it exactly as it is spelt. yes, i agree that a deeper and more accurate historical progression is interesting. I also noticed that commonality but is surprised of the possible connection. It really is stirring my interest.. I should have added that the spelling variation I saw suggests the full pronunciation - i or y, sometimes e at the end. When a name frequently has a reduced pronunciation, it usually gets written in a reduced form as well. For example my grandfather's name was Sandoe, occasionally written as Sanda or Sandah (and very occasionally Sander, which in Cornwall means the clerk was nonrhotic). I just searched explicitly for Bosun and nothing came up. I was born a Boatswain, since married, I have been researching our family tree and I have got as far as Dorset, Weymouth in England...we are in Australia now, our family member William Henry Boatswain travelled here in 1854, earliest member I can find is 1790 Thomas Boatswain. He is of the Patrick and Sita Boatswain (She was a Cooley Sambo) line of Montserrat. They are my great-great grandparents on my father's mother's side. So it appears, that we are all connected, the Boatswains that is, English origins it appears, and can trace ancestry to the same place - how nice to know. which line are you related to? My grandmother was a Boatswain, born and raised on Montserrat. She settled in New York about 1913. I have been tracing the family history with limited success. The volcano has resulted in many Montserratians leaving the island permanently and original records appear to be scarce. I am a Boatswain as you can see, born and raised in London. My mother carries my grandfather's name which he in turn rescued after he became a Harris. My father wanted my mother to pass on her name as it meant so much to her. There is many of us living in London, unfortunately my grandparents who brought all the Boatswains over have passed in recent years and are buried in East London. 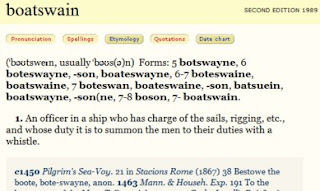 There is also a lot of Boatswains located in New York. We've always pronounced our name as written. Hello, I'm a Boatswain from the Republic of Trinidad and Tobago. My grandfather is from St. Vincent and I know there are very few Boatswains in Trinidad. Not to sure if we are all related.